Krishna Janmashtami 2014 is the appearance day of Bhagwan Krishna. He appeared at midnight of the eighth waning moon which falls in August/September. This is one of the greatest celebrations of the Hindu community which is observed throughout India, in Vrindavan, and around the world as far as Austin and New York. In the Temples devotees sing and chant the glories and the leelas of Krishna up to midnight. Then they do arti of Krishna and distribute prasad. In Vrindaban there are a number of professional groups who enact the leelas of Radha Krishn on the open stage. Areas of Prem Mandir Vrindavan is specially displayed with the childhood events of Krishna and great crowds come to have its darshan. At Shyama Shyam Dham Vrindavan, near Prem Mandir Vrindavan, in the elaborately decorated Satsang Hall, Janmashtmi 2014 will be enthusiastically celebrated by thousands of devotees during a 3 day Krishna Janmashtami 2014 sadhana program 2014. A lovely cradle of baby Krishna will be lovingly placed in the Satang Hall and everyone has the opportunity to have darshan and swing the Divine child. Throughout the day and up to midnight, devotional programs will be arranged in Vrindavan which include one act plays and dances related to Radha Krishna leelas. Chanting of Krishna Janmashtami leelas and the songs of His appearance, special arti of baby Krishna and Jagadguru Shree Kripalu Ji Maharaj's speech, explaining the importance of Krishna Janmashtmi in a devotee’s life, highlight the celebration. It was the tradition on this occasion Jagadguru Shree Kripalu Ji Maharaj himself does the arti of Shree Krishna. Krishna Janmashtami 2014 will be joyously celebrated at Radha Madhav Dham USA, the official ashram founded by Jagadguru Shree Kripalu Ji Maharaj in America. People come from all over Austin Texas and America to feel the connection with Shree Krishna on His Divine Birthday and for many, Krishna Janmashtami 2014 will be the highlight of their year. Some highlights include a magnificent Krishna Janmashtami 2014 speech illustrating the real meaning and significance of Krishna Janmashtami 2014. Other fun and devotional events include Kids Costume Contest, live chanting of kirtans and bhajans, darshan of baby Krishna in a swing, arti and abhishek and of course, a delicious feast for all present. Join the RSVP page and invite others. 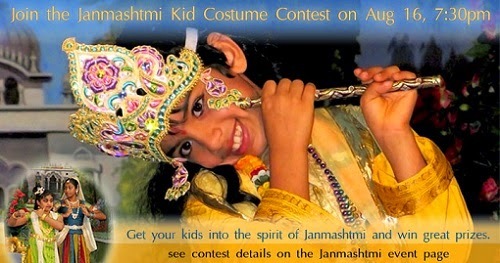 Visit the official Janmashtmi Austin website if you want to know more. And finally, visit the Vrindavan Times news to read an article about Krishna's Birthday 2014. 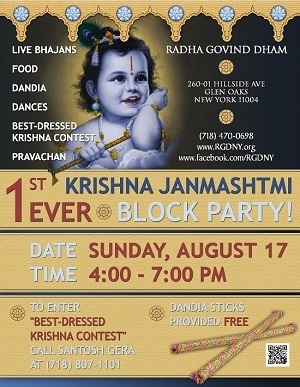 New York's newest Hindu Temple is celebrating Krishna's Birthday 2014 in an amazing style - the first ever Krishna Janmashtami street party which is expected to be very popular. There will be a special best-dressed Krishna contest for New York kids, outdoor kirtan concert by acclaimed singer Anuradha Khanna. There wil also be outdoor dancing and garba, and a unique Krishna Janmashtami 2014 message by Swami Nikhilanand. Join the New York RSVP page and invite others. Visit the official website for Krishn's birthday NY if you want to know more. You can also visit the Vrindavan Times news to read an article on Krishna's Birthday festival in Hillside, Glen Oaks. There are many other great resources to help you get into the mood of Krishna Janmashtami 2014 including, Krishna, the Living God of Braj, a book by D. Anand. Another resource to learn more about the customs and traditions of the celebration is BBC Website on Krishna Jayanti 2014.